Tuesday morning’s session was given by students from NUR’s Student Club for Unity and Reconciliation (SCUR). The club currently has 200 members (some of whom we’d met the day before) and since its inception in 1999 has strived to live up to its name by engaging in a number of activities and programmes, such as school and prison visits that foster national unity. The presentation was given by the chairman of the students Club, and covered the club’s history, its current activities and achievements as well as its challenges. We then moved on to discuss as a group how SCUR could best address those challenges it faces. 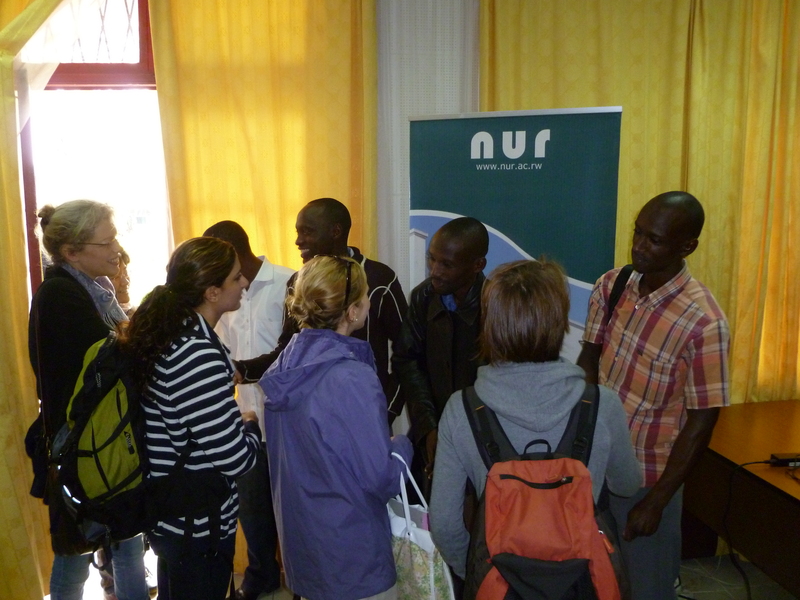 Following the discussion, a small group of us visited NUR’s HIV/AIDS clinic. We were welcomed by the clinic’s staff who then gave us a tour of their facilities. They explained to us that they offer students and staff at the university free, discreet HIV testing and counselling services; distribute free condoms, and promote HIV/AIDS awareness through regular campaigns. In the afternoon, we met the deputy Director of the Centre for Conflict Management. He described how CCM was created in 1999 as a way to address a knowledge gap in the field of genocide, peace and reconciliation studies in Rwanda, and in the Great Lakes Region as a whole. He also stressed that both NUR and CCM are firmly committed to their role as practical and academic contributors to the global eradication of ethnic hatred. To this end, they provide training and dialogue sessions for local organisations, contribute to a range of publications and are developing short courses in topics such as negotiation, mediation and gender. In the evening, Birasa our programme coordinator from NUR very kindly invited us all to his house for dinner. For most of us (except John, obviously) it was our first visit to a Rwandan home. Thanks to the hospitality and generosity of Birasa and his wife Clariss, as well as their charming 2 year old son , we were made to feel at home straight away. And the food was fantastic – ‘the best we’ve had in Rwanda’ was the general consensus (the two Peters and Philip were especially happy with the foo-foo!). So thanks again to Birasa and his lovely family for a such fantastic evening! We’d arrived in Butare just before nightfall the evening before, staying in a hotel a short walk from the main campus of the National University of Rwanda. 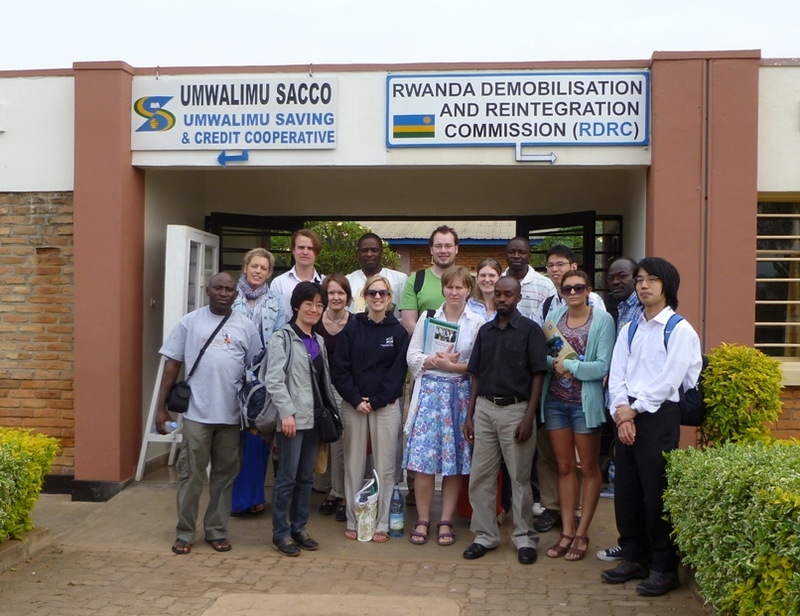 Our time in Butare is going to give us a chance to interact with Rwandan students and visit some NGOs. We started our first day in Butare with a lecture by Professor Herman Musahara on the NUR’s role in post-genocide reconstruction. He not only told us about the role NUR academics had played in promoting genocide ideology but also about the university’s contributions to national unity and reconciliation since 1995. 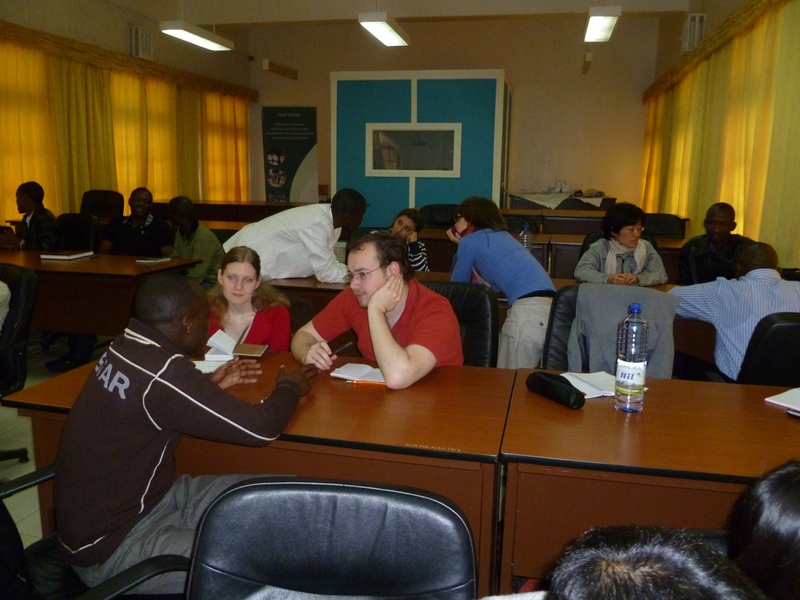 To help achieve this, the University created the Centre for Conflict management in response to the challenges raised in the post-genocide context. After the lecture, we had the opportunity to meet some of NUR’s students who then showed us around the extensive campus which not only has the usual academic buildings you’d expect at a University but also a forest that’s home to chimpanzees! In the afternoon, we visited the Maraba Coffee Farming and Washing Stations, which is a cooperative project initiated by NUR. We were shown around by Jean-Marie whose passion for the project certainly rubbed off on us. He introduced us to ‘worm tea’ (which is a type of organic fertilizer), and encouraged us to listen to the sound happy, healthy worms make (squelchy noises, in case you were wondering!). We were also taken to see the coffee washing stations and the financial coordinator who outlined some of the financial and social benefits of the project. The visit definitely made us more aware of the extensive effort and enthusiasm that is put into coffee production! On Friday afternoon, after we had managed to squeeze our luggage into the bus before our drive to Ruhengeri, we went to the Demobilisation and Reintegration Commission in Kigali. Here, Mr. Francis Musoni (Coordinator of the Rwanda Demobilisation and Reintegration Commission) told us that the programme’s goals are to contribute to peace in the region as well as helping to foster national unity. He also told us how Rwanda offers economic as well as social support to ex-combatants and their dependents in order to facilitate their reintegration. The information he gave us was very relevant as the next day we were going to visit the Mutobo demobilisation centre near Ruhengeri. But before we set off on the next leg of our journey, we had time to have a quick look round the Amahoro Stadium which played such an important role during the genocide. It was dark (and rather chilly, compared to Kigali) when we arrived in Ruhengeri but it was great to see another part of the country. The next morning, we went to MUTOBO Demobilisation Centre which currently has nearly 250 ex-combatants taking part in a reintegration programme. Mr. Jean-Marie Turabumukiza told us about the Centre’s work and how the programme includes lessons on topics such as good governance and gender issues to entrepreneurial skills employment opportunities. 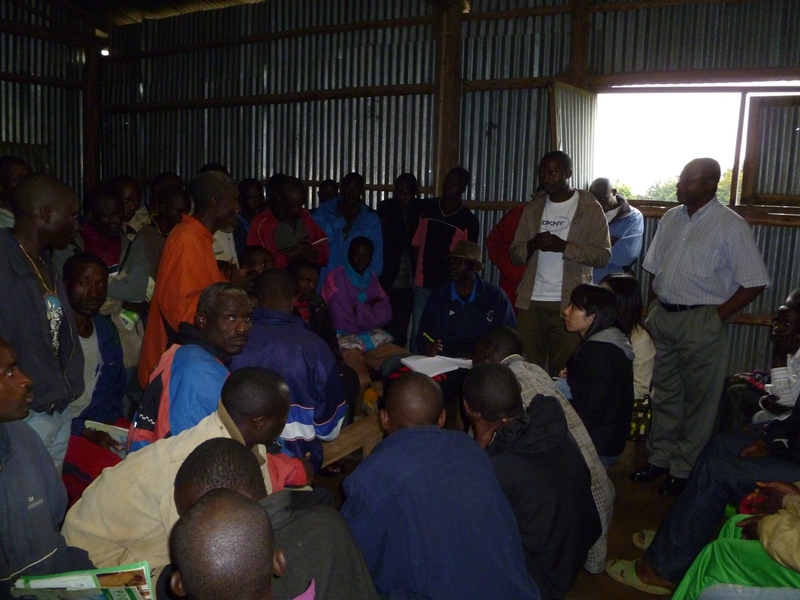 We were then invited to hear testimonies from some of the ex-combatants. They welcomed us by singing and dancing – something we certainly weren’t expecting! We were also given the opportunity of breaking off into smaller groups so we could talk on a more individual basis to the former combatants who had all been part of military groups in eastern DRC. It was a memorable experience to speak on a one-to-one basis with them and to learn a little more about why they had decided to return to Rwanda. After photos we were once again treated to more singing – this time ‘goodbye’ song – and some impressive dancing (both by the ex-Ags and by some of our group who joined in with them). Then it was time to hit the road once more – we were off to Gisenyi! In the evening, Birasa our programme coordinator from NUR very kindly invited us all to his house for dinner. 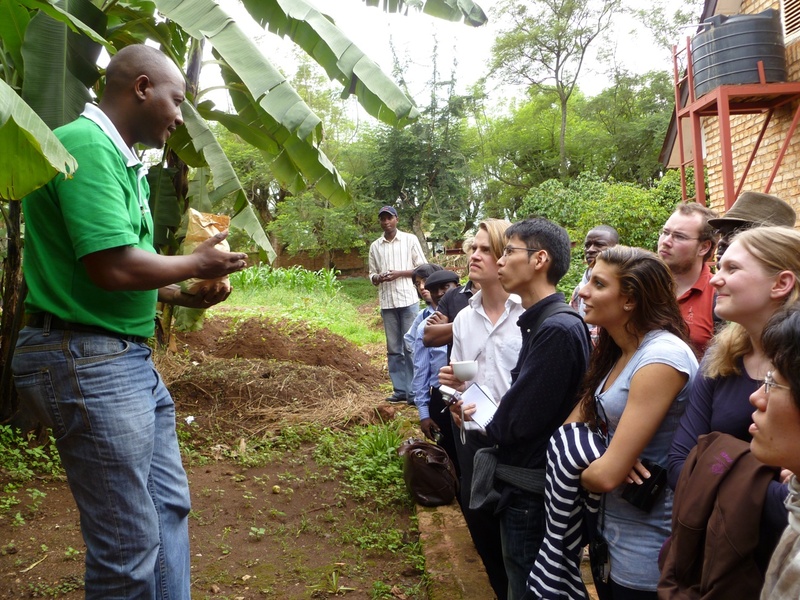 For most of us it was our first visit to a Rwandan home. Thanks to the hospitality and generosity of Birasa and his wife Clariss, as well as their charming 2 year old son , we were made to feel at home straight away. And the food was fantastic – ‘the best we’ve had in Rwanda’ was the general consensus. (The two Peters and Philip were especially happy with the foo-foo!) . So thanks again to Birasa and his lovely family for a such fantastic evening! 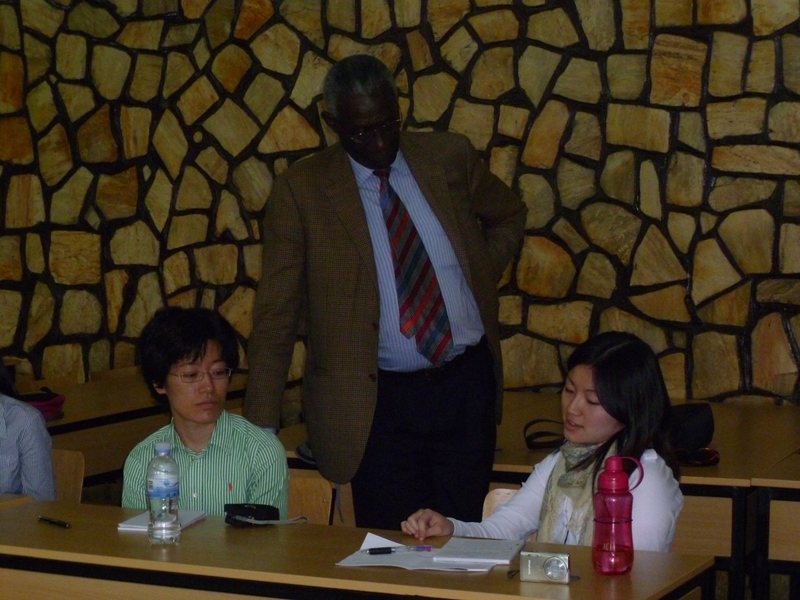 We started Day 5 (Thursday, 17th of March) of our Study Visit with a lecture on the Electoral Process in Rwanda which was presented by Professor Chrysologue Karangwa, Chairman of the Electoral Commission. He began with an overview of the history, functions and aims of the National Electoral Commission before telling us in more detail how elections for the upper and lower chambers of parliament are organised and how seats are distributed to ensure the principles of national unity, national interest and power sharing are met. We were very grateful to him for not only shedding light on the electoral process in the country, but also for answering our numerous questions despite having such a busy schedule. Following the lecture, we visited Bosco School. This is the school that many of us knew about from watching the film ‘Shooting Dogs’ which tells the story of what happened at the school during the genocide. 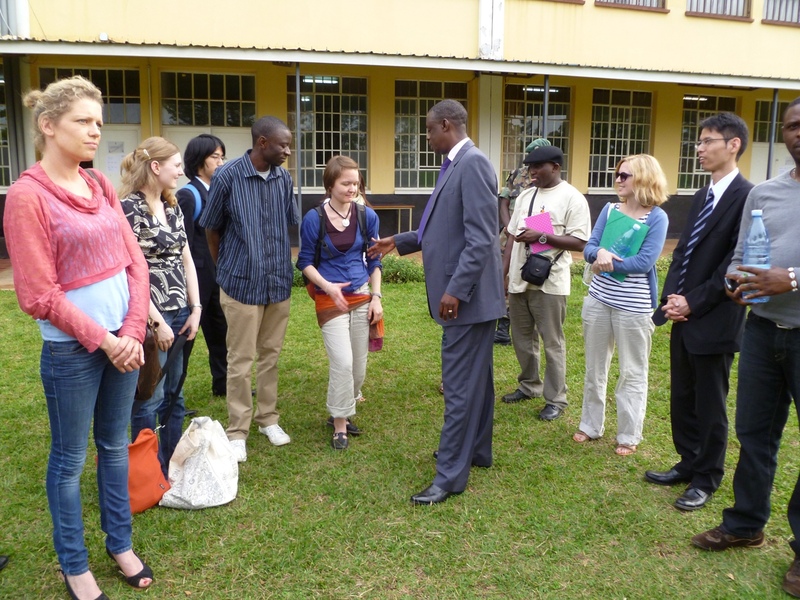 Today, it is no longer a school, but a vocational and technical training college called IPRC Kigali City. However, there are still reminders of its past, such as the UN vehicles abandoned there in 1994, and the plaques that act as a reminder of what happened and as a memorial to those who died. We were shown around the campus by Staff Members of the college and we discussed some of the issues with the Headteacher of the college who told us how the curriculum followed at the college aims to provide high quality training that will help students gain a firm foothold on the career ladder. And then it was back to our lecture hall again. No time for lunch, because we certainly didn’t want to keep our next guest waiting – the Minister of Defence and National Security! General James Kabarebe gave us a lecture entitled ‘Security Dynamics in the Great Lakes Region of Africa: Promises and Perils.’ He started by giving us a historical perspective of Rwanda and the Great Lakes Region, before going to on Rwanda’s regional peacekeeping and peace building role, in DRC and beyond. As usual, we had a lot of questions (Peter especially given his interest in Eastern Congo) which ranged from the role of international law to reintegration and demobilisation. After ‘Question Time’, we moved on to the grass for photos and had the chance to chat more informally with General Kabarebe. But our day didn’t finish there! In the evening, we were joined at the hotel by Rama Isibo, a journalist and media consultant. Yet again, we got so into our discussions that we didn’t finish until about 11 o’clock again. These late night conversations seem to becoming a habit! Yet another busy day in Rwanda! 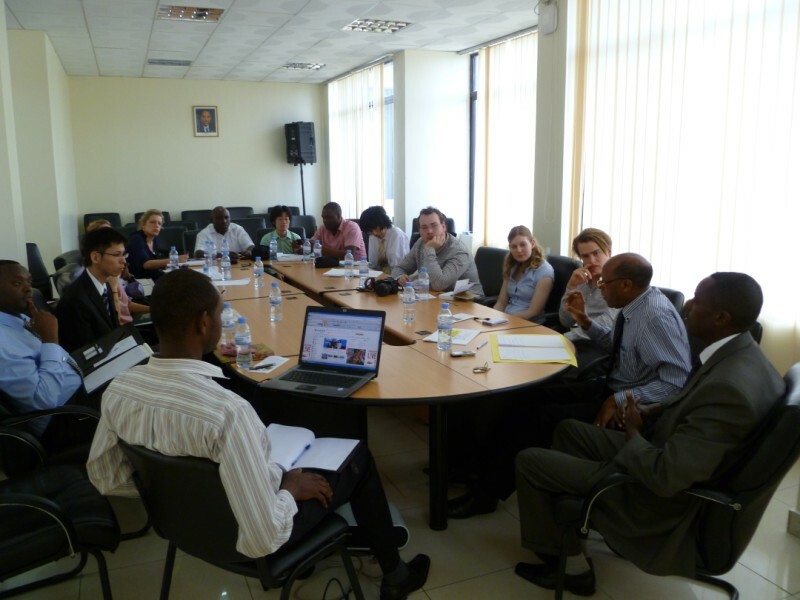 Today’s theme focused on economic development in post-genocide Rwanda. Our first lecture was presented by Mr Leonard Rugwabiza, Director General of National Development Planning and Research Department from the Ministry of Finance and Economic Planning. He gave us an insightful lecture on the vital nature of economic development and the country’s innovative vision for 2020. After the lecture, Mr Rugwabiza very kindly invited us to take a tour of the Ministry of Finance and Economic Planning with him. We naturally accepted, and all really enjoyed looking around the ministry – we even bumped in to an alumnus from Bradford there! In the afternoon, Joseph Kabakeza made a presentation on the role of the Diaspora in peace building and development in Rwanda. We heard about various diaspora and community development projects such as the ‘One dollar campaign’ and ‘Bye Bye Nyakatsi’ campaign which aim to provide houses for orphans and the poor. After yet another lengthy but extremely interesting question and answer session, we set off to our next meeting, at the Rwanda National Police headquarters. One of the first things that we all noticed after arrival in Rwanda was how well organized the police is and how safe it made us feel – whether in taxis or walking around. 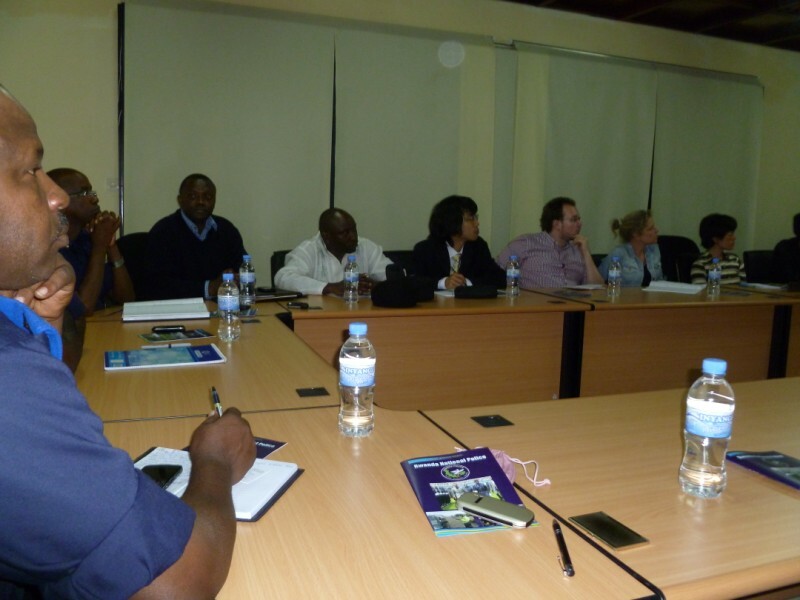 Inspector General – Emmanuel Gasana’s explain to us country’s policy and work, and gave us briefing on the security situation in the country (what is very useful considering our Visits to other regions of Rwanda in the week to come). During question and answer session, he also told us about the importance placed on police training, how they support community projects, and the methods they are using to combat the challenges they face. We really appreciated being given the opportunity to hear first hand from the Inspector General about the importance of the work of the police as an aspect of peace building and reconciliation efforts that are taking place in Rwanda. For anybody who thinks that participants on a Study Visit have an easy time, then think again. Today we had a really packed, busy but extremely valuable day that started at 9 in the morning and ended at 11 at night! We were treated to a range of lectures and discussions on various topics yet we also found time to have fascinating conversations with some unexpected guests. We started the day with a visit to the National Museum of Rwanda, that is located in Habyarimana’s house. Our wonderful tour guide shared lots of information and stories about the house and its history with us. We all enjoyed peeking at the remnants of presidential plane (that was shot down on 6th of April 1994 and went down directly to the compound of presidential residency); we visited also presidents’ private quarters and even saw President Habyarimana’s pet python’s swimming pool (the python was thankfully long since gone). We then set off to our first lecture of the day which was held in our ‘own’ lecture room at the St. Paul Pastorale. It was given by Denis Bikesha from the National Service of Gacaca Courts and he told us more about the role they have played in transitional justice in post-genocide Rwanda. He provided us with an insight into the workings of the gacaca courts as well as the challenges faced and successes enjoyed by this form of justice. We took part in a very lively and interesting question and answer session, and once again, the lecture took up much more time than we’d anticipated. 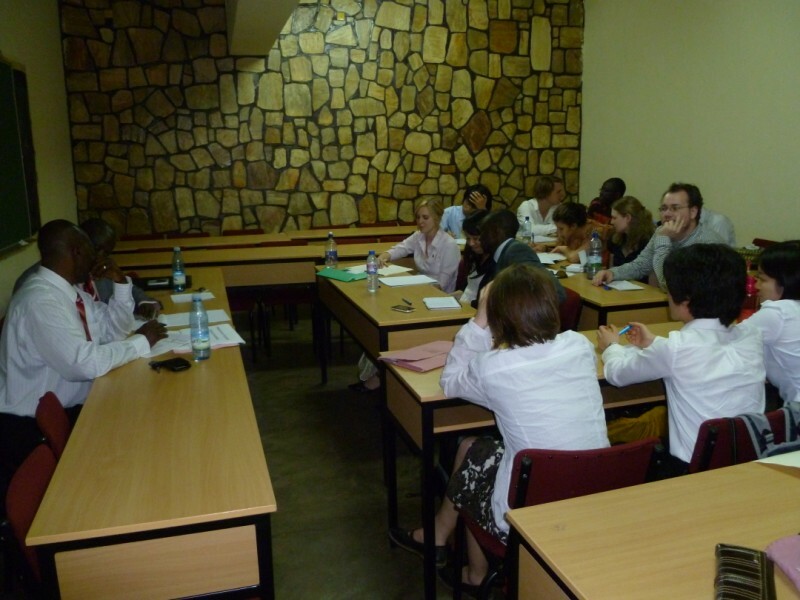 The focus of our afternoon session was the role of the justice sector in post-war reforms in Rwanda. It was given by Alphonse Hitiyaremye and John Bosco from the Prosecutor General’s Office. They gave us an overview of how the prosecution system is organised and also how the justice sector has played such an important role in reconciliation. Dodging the downpours, we then went for dinner at a Rwandese restaurant called Karibu where we enjoyed the company of two unexpected guests, Mrs Usta Kaitesi (a lecturer in faculty of Law at National University of Rwanda) and Dr Kazuyuki Sasaki. We were very grateful to them for sharing their vast experience and knowledge with us in an informal setting, but we had so many questions for Dr Sasaki that he kindly agreed to come back to our hotel to continue our discussions… until 11 o’clock at night! In the morning we were introduced to a new, but very welcome, member of our group – Alex, our bus driver from Butare who will be accompanying us for the next two weeks on every trip that we will be taking. We started our day by a Visit to the National Commission for the Fight against the Genocide. We met six staff members, who each deal with different aspects of work conducted by the Commission. The main presentation was made by Ildephonse Karengera (Director of Memory and Prevention of Genocide) and Chairman Jean de Dieu Mucyo took part in the question-and- answer session. Initially our lecture was scheduled to take an hour and a half, but in the end it was extended to twice that time, and even then we wished it could have been longer as there were still lots of questions we wanted to ask! The discussion centred mostly on the issues of genocide education, commemoration of genocide, the role of genocide survivors in commemoration process, issues relating to history curriculum in Rwanda. As a group, and on an individual basis, we received an open invitation both to set up separate meetings with particular members of the Commission as well as being offered access to the library. This will be especially useful considering the wide range of academic interests within our group. 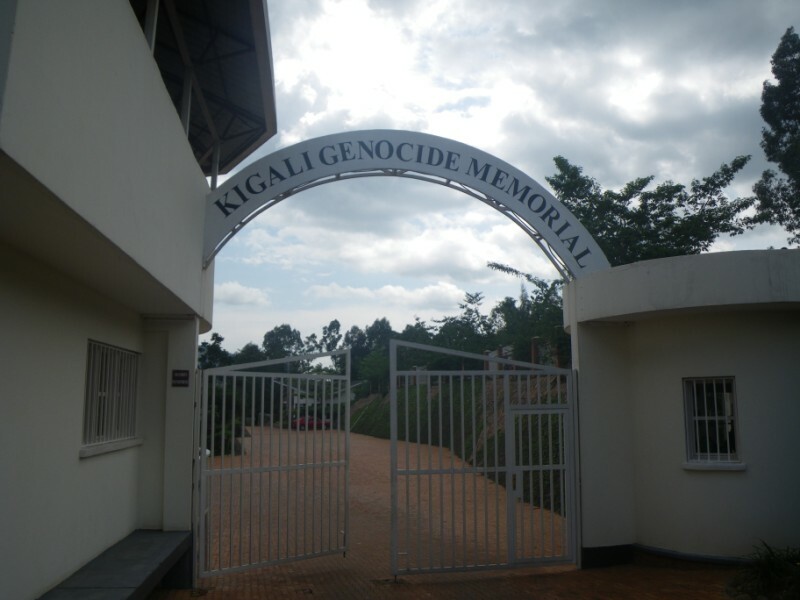 Our discussions were extremely insightful considering that an hour after our meeting in the Commission we all went for a tour at Kigali Memorial Centre. Some of the themes that we raised during our morning meeting were followed up and some were explored during our individual discussions with people working within different Departments of the In the morning we were introduced to a new, but very welcome, member of our group – Alex, our bus driver from Butare who will be accompanying us for the next two weeks on every trip that we will be taking. 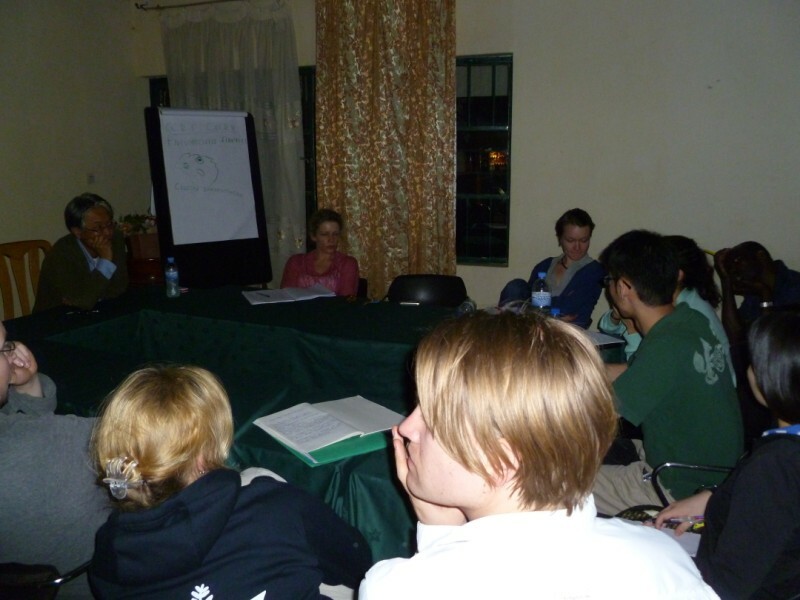 Our second day in Kigali ended with an evening summary and discussion around a fire! Our emotions and thoughts regarding the day naturally varied from individual to individual; but we were all in total agreement that to experience the complexity of the issues facing Rwanda first hand is exceptionally valuable.